Unlike a year-specific calendar, which must be thrown out once the year is over, a perpetual calendar can be used year after year. Perpetual calendars make thoughtful gifts and are useful and practical. You can make them yourself, even with the help of your children. When everyone helps, the perpetual calendar can be a gift for an entire family from a entire family, allowing you to cut down on the number of individual gifts you must buy. Make a grid for the calendar on the dry erase board using the permanent marker and the ruler. You may want to sketch it out lightly with a pencil before using the permanent marker. Make sure the grid has seven columns across the top and seven rows down the side. Leave room across the top to place the month. 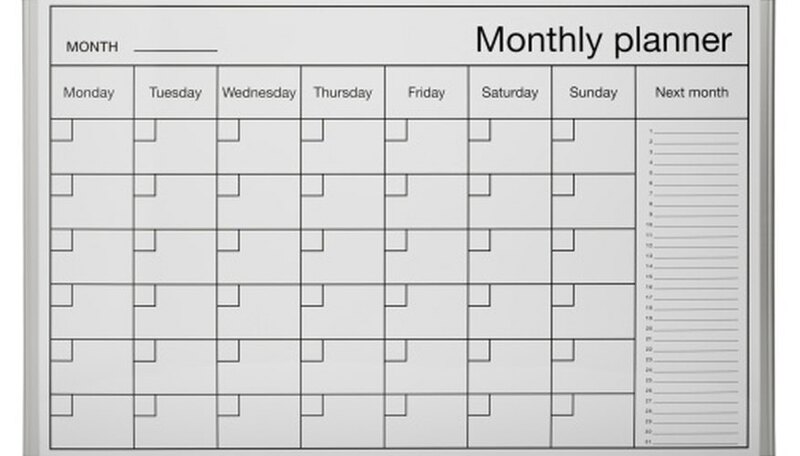 Printing a calendar grid out from an online source is a simple way to see how to set up the grid on your dry erase board. Cut 12 strips from the magnetic sheeting, one for each month of the year. The ruler and pencil will help you make neat, uniform strips with straight lines. Cut them to a size that will fit nicely in the space you've left at the top of your calendar grid. Using the permanent marker, write the names of the months on the magnetic strips, one month per strip. Again, if you'd like a finished product that looks a bit neater, use computer printouts and simply glue them onto the magnetic sheeting or stick-on scrapbook lettering. Cut 31 squares from the magnetic sheeting, sized to fit nicely inside the boxes on your grid. The ruler and pencil will help you make neat, uniform squares with straight lines. Use a permanent marker, computer printouts or scrapbook stickers to number each square with the numerals 1 through 31. Place the current month magnet strip at the top of the calendar, then place the date magnets in the appropriate boxes on the grid. Keep any unused month and date magnets in a handy spot near the calendar so they'll be ready to use when a new month begins. At the beginning of each month, update the name of the month and rearrange the date magnets to suit the new month. Get as creative as you like. For example, use brightly colored permanent markers, decorate the calendar's white space, leave a portion of the dry erase board blank for notes, or cut additional magnet squares to make holiday and special occasion markers. Or, consider the room where the calendar will be displayed and design the calendar to coordinate with that room.